Greg Laslo was NAFI Mentor’s editor until 2011. 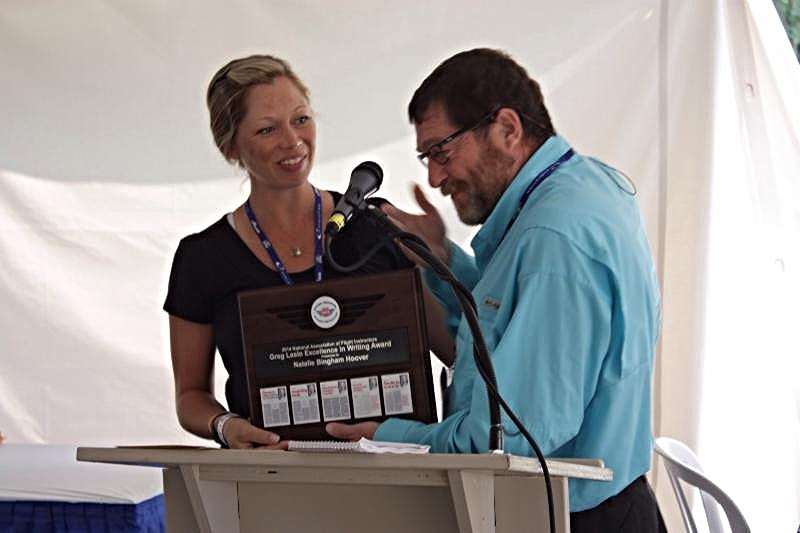 The award named in his honor is presented annually to an individual or organization making a significant contribution to NAFI publications through content in Mentor Magazine, eMentor Digital Newsletter, and contributions in other industry outlets. 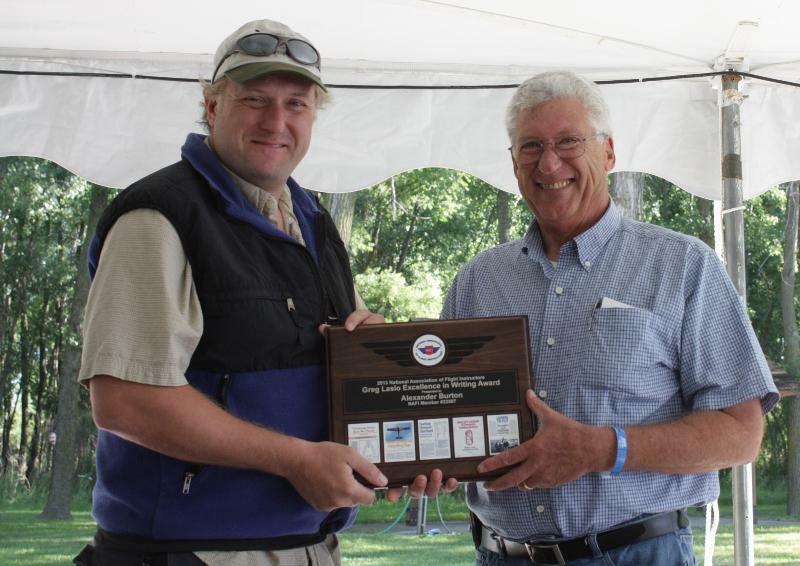 Clark, a longtime aviation writer and frequent contributor to NAFI Mentor, and other aviation magazines, is a professor at Embry-Riddle Aeronautical University. He served as a U.S. Navy attack jet pilot and owns a Cessna 170. In addition to his magazine articles and academic essays, Clark is the author of two books, From Cubs to Jets, Essays From a Life in the Air, and PSST! Wanna Know a Secret. Clark's 9,000-plus flight hours include the A-7E Corsair II, the A-4 Skyhawk, and 88 aircraft carrier landings. He graduated from the University of Florida, worked as a newspaper journalist and then began flying professionally. He logged 3,000 hours as a flight instructor and Part 135 charter pilot before enlisting in the Navy. After earning his wings at Naval Air Station Meridian, Mississippi, his first assignment was Fleet Composite Squadron TEN in Guantanamo Bay, Cuba, where he flew the A-4 Skyhawk. Upon completion of that tour, he began A-7E transition training at NAS Cecil, Florida, and joined a West Coast Corsair II squadron based at NAS Lemoore, California. After leaving military service in 1990, Clark joined Embry-Riddle Aeronautical University (ERAU) as a flight instructor, and since 1998 has been an assistant professor of aeronautical science at ERAU in Daytona Beach, Florida. 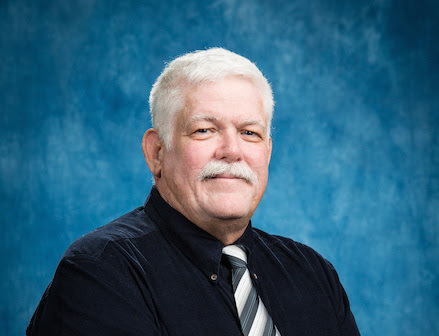 ERAU recently honored him with a meritorious service award in recognition of his articles published in Mentor magazine and other publications. Clark and his wife, Ardis, live in St. Augustine, Florida, where they own and operate BluewaterPress LLC, a publishing company with a significant menu of aviation titles as well as books of general interest. Larry has been flying for 40+ years and has over 7500 hours in more than 90 types of aircraft, including more than 3000 hours dual instruction given. He lives in Seymour, IN and is an FAA Designated Pilot Examiner and FAASTeam rep for the Indianapolis, IN FSDO. 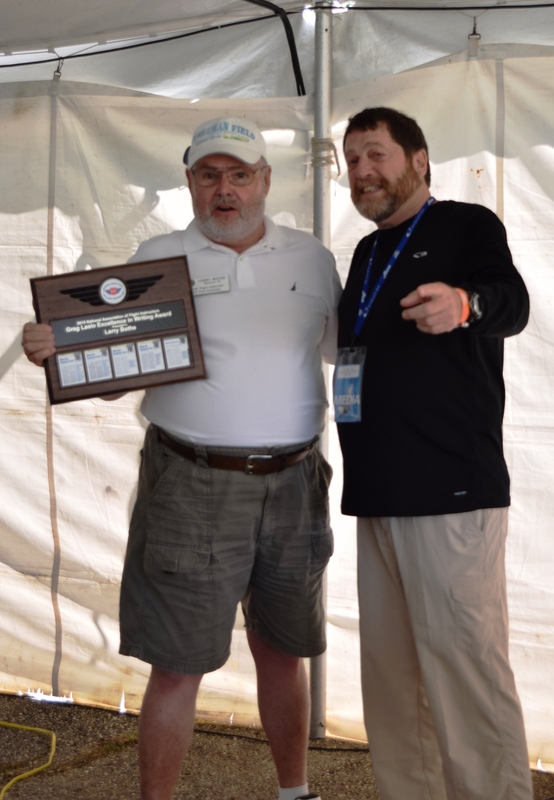 Larry was the 2004 Indianapolis FSDO Aviation Safety Counselor of the Year and the 2009 NAFI Flight Specialist of the Year. He is rated in airplanes (land and sea), gliders and helicopters; and is part-owner of a 1961 Champion Model 7EC taildragger. In between checkrides Larry instructs for Cherry Hill Aviation in Seymour. Natalie Bingham-Hoover is the Assistant Chief Flight Instructor at Air Venture Flight Center at KOLV in Olive Branch, Mississippi. She has more than 5,500 hours total flight time and has given more than 4,000 hours of flight instruction. She holds ATP, MEI, and CFII ratings and is a Gold Seal CFI. She is type-rated in the CRJ-200 and Beechcraft 400A. She is the lead FAA Safety Representative for Tennessee, and was the 2012 FAA Safety Representative of the Year for Mississippi. Alex Burton is the chief flight instructor and base manager for Selair Pilots Association in partnership with Selkirk College based in Abbotsford, British Columbia, Canada. He is a Class 1 instructor and pilot examiner and holds an ATP endorsed for both land and sea. Alex has been a regular contributor to Mentor and other aviation publications both in Canada ad the United States. His two-volume collection entitled Flight and Flying is available through Amazon Books for Amazon Kindle.